At Hinterland Chiropractic, we don’t believe in masking pain with drugs, we want to achieve the optimum structural result for our patients.We want to correct any structural and postural imbalances and restore the natural curve to your spine.There are a few things our patients can do to improve their posture and thus relieve stress on their delicate nerves. In this day and age, it’s quite common for us to spend long periods of time sat at our desks. 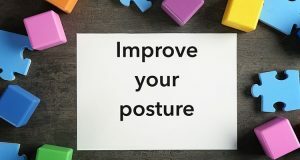 You might not notice that you’re slouching or how your sitting stance is affecting your posture, but with a few little tweaks to how you sit you could enjoy much improved posture. Adjust your chair so your feet can lay flat on the floor and adjusting your armrests so your arms can rest on them to alleviate stress from your shoulders.Keep your keyboard and mouse in easy reach on the same surface, whilst typing keep your wrist straight and your elbows close to your body.Do an ergonomic make-over to your workspace, and see your posture improve dramatically. Sometimes you might not be aware of your bad posture, but if you make a mental note to check you might be surprised at how quickly you’ll adjust. Imagine a ruler going from your head to the ceiling. Try and make sure that ruler is straight, before you know it you will naturally adjust to your new stance. You can visualise this, or you could practice walking with a book on your head. Doing this will prevent slouching and encourage great posture. The words you can still hear in your mother’s voice. But your mother was right, sitting up straight will help align your back and prevent stress on your spine. Whilst you won’t be able to control your posture whilst you sleep, there are a few things you can do to wake up without that aching feeling. Try a firmer mattress for a start. Sleeping on your back will also assist in helping those aches and pains. Lying flat with a pillow behind you is the perfect position, but go easy on the pillows as you don’t want to crane your neck. Take a look at our Chiropractic Special. You have nothing to lose but the pain.